"On this day of July 7, 2012, a prominent international group of cognitive neuroscientists, neuropharmacologists, neurophysiologists, neuroanatomists and computational neuroscientists gathered at The University of Cambridge to reassess the neurobiological substrates of conscious experience and related behaviors in human and non-human animals. We declare the following: “The absence of a neocortex does not appear to preclude an organism from experiencing affective states. Convergent evidence indicates that non-human animals have the neuroanatomical, neurochemical, and neurophysiological substrates of conscious states along with the capacity to exhibit intentional behaviors. Consequently, the weight of evidence indicates that humans are not unique in possessing the neurological substrates that generate consciousness. Nonhuman animals, including all mammals and birds, and many other creatures, including octopuses, also possess these neurological substrates.” "
Animals are aware of themselves? They feel emotion? How about that, Chuck. I think I'll punctuate this news with a photo I saw yesterday of two silverback gorillas embracing after spending almost 3 years apart. Kesho and his younger brother Alf were separated after the elder sibling was sent to London Zoo as part of a breeding programme. 'We weren't entirely sure that the brothers would even know each other, but the moment they met you could just see the recognition in their eyes,' [head gorilla keeper Mark Tye] said. 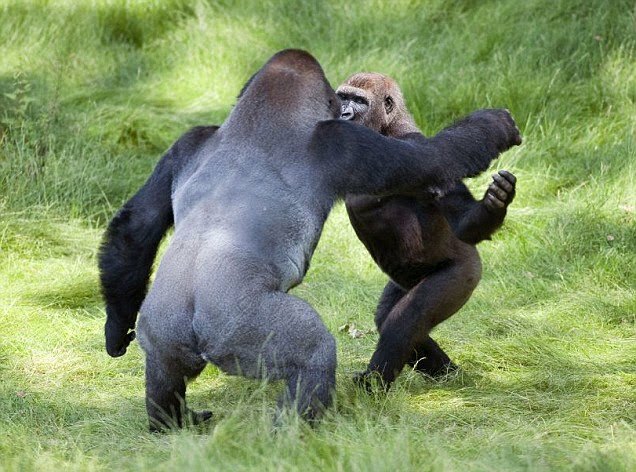 ________Photo and story of silverbacks from The Metro, UK. We heard Crick speak in Memphis some years back, on mind/brain duality. Talk about a pompous scientist! Totally dismissive of any ideas but his own. E.g., he completely dismissed the idea that dreams can be meaningful--said they're just brain "junk." I must say that's *not* been my experience. Over many years I've had some remarkable dreams that clearly indicated what was of concern at the time, as well as "visitation" dreams from loved ones who had passed on. Also a couple visionary dreams. Awesome story about the silverbacks. Sad story about Crick, but a lot of people claiming to be scientists like to dismiss things they haven't even investigated.